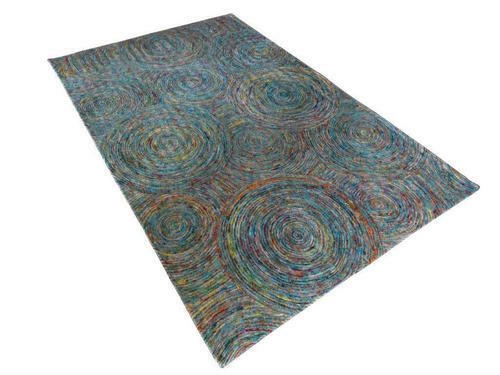 This Silk Rug is handmade using recycled silk yarns.This Rug features a flat woven finish with multi colored strands to create a low level loop. Each rug has a felted backing and all edges are hand stitched. A truly transitional collection that will look amazing in both a contemporary or traditional setting. These stunning silk rugs are hand made using recycled sari silk yarns, featuring a flat woven finish that is soft, yet surprisingly hard-wearing. Each rug is made using a complementary palette of jewel-like colours adding a Far Eastern ambience to your living spaces. The rugs come in a range of colours and sizes which will blend seamlessly with your décor and add the Wow Factor that you’re looking for. Each rug features a felt backing with hand stitched edges for extra durability.